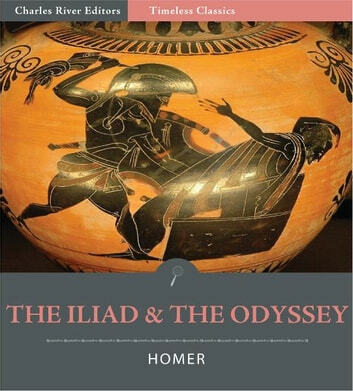 Perhaps the most famous epic poems ever written, Homers The Iliad and The Odyssey have been read for nearly 3,000 years, making them also two of the oldest written works in the Western world. The Iliad covers the end of the Trojan War, making characters like Paris, Helen, Achilles, Hector, Odysseus, and Ajax instantly recognizable, and the Trojan Horse made people caution of Greeks bearing gifts. Its sequel, The Odyssey, chronicles Odysseus return home to Ithaca after the burning of Troy, and the adventures his crew experiences as they combat sirens, gods, and a Cyclops. Homers poetry influenced Virgil and every other great poet ever since, and it literally put Troy on the map, motivating Heinrich Schliemann to search for and ultimately find the city of Troy in the 19th century. This edition of Homers The Iliad & The Odyssey includes a table of contents and is illustrated with pictures of scenes and characters from both works.